In other words, Le Guin managed, in the decades in which she created many worlds, many cultures, with many genders and many variants of day and night, oxygen-blended atmospheres and velocities of rotation, to not only succeed at writing science fiction, but also managed to transcend it in novels like The Lathe of Heaven and The Left Hand of Darkness. In the culmination of her consideration of all things Le Guin, Atwood gives a quote of the sort that causes publishers to kvell, and that become the basis of author public relations presentations (and literary projects) for years to come. This is perhaps the seed within the shell, the nut-meat within the nut, when it comes to contemplating Le Guin. Because it is this aspect—as native to her writing as the sense of the absurd is to Vonnegut—this connection to creation, that is the connective tissue that binds together all that our author wrote in her decades of output. Strange, though, that Margaret Atwood, in issuing such a resounding paean to Ursula Le Guin and all her many genres, many works, from short to novel-length fiction, to YA fiction to essays to books on both how and why to write, should leave out Le Guin’s many contributions to another form of creative writing—and the one in which her connection to “the immense what is” is most apparent. Perhaps there is a curse of sorts that is placed upon writers who become too successful at some specific sort of writing, because their talents for other things are all too often ignored. How many, after all, are aware that, while Le Guin sort of burst on the scene as a novelist and science fiction writer in 1966, she had actually been first published as a poet back in 1959? Or that the eight collections of poetry that she produced over the years would have, all on their own, established her as a poet of note, had she never written any prose along the way? Indeed, while writing her marvelous fiction seemed always to expand her world, creating poetry seemed always to be the means by which Ursula K. Le Guin defined it. The one form of writing was exploratory, the other, meditative, contemplative, and revelatory. Back in 2012, Le Guin published what was very likely seen as her last book of poetry. Called Finding my Elegy: New and Selected Poems, it gave its readers a chance to look not only at the author’s development as a writer, but also her philosophical development as well. And as the titular search for a proper elegy indicates, it did so with something of a summing-up attitude. But now, today, we have been given the gift of one more, one last, collection, with perhaps the saddest of subtitles. 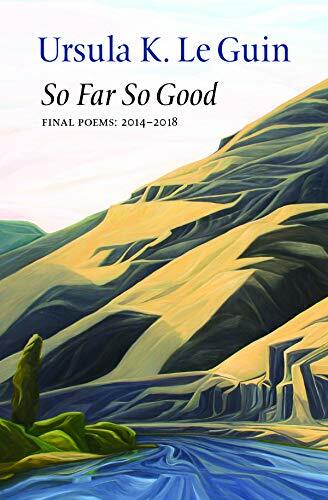 So Far So Good: Final Poems 2014–2018 is that wonderful thing, the manuscript hidden in the desk drawer, lost and then found, the sheaf of ditties, bound in old lace, stored away up in the attic. And how churlish it would be, given all this, what with the awards and the praise and Margaret Atwood and all, to sit in judgment of Le Guin’s farewell and find it lacking. Cattle make cropping short grass. Dims away slowly. Now no wind. Am eased by the majestic order. I am old. The quiet music of her words, the gentle acceptance of the nature of things, the sounds of cattle chewing, the power of fog to eradicate the structure of seasons, the hints of mortality in all the corners of the pages and in the spaces between the words, these are those connections to what is. There are many collections of poetry that rail, that question, that fuss and stomp. But few that are as knowing, as accepting. The happy woman who loved her wicked city. Do not remember me with pity. Into the desert of your pitiless faith. Those springs are dry, that earth is dead. I looked back, not forward, into death. So Far So Good is a lovely way to be able to remember Ursula K. Le Guin and to be reminded of all the many wonderful things, including that corpse dissolving in the rain, that she has left behind.